A string of European strikes against rising unemployment and austerity measures will affect air travel in Britain. Workers in 40 groups from 23 countries around Europe look set to protest as part of The Day of Action and Solidarity across the European Union, including Spain, Greece, Portugal and Italy. The walk-out, led by the European Trade Union Confederation, has prompted Heathrow and Gatwick airports to cancel some of today's flights. Gatwick has stopped five departures and five arrivals between the UK and Lisbon, Porto and Madrid, while Heathrow has so far cancelled 12 flights. Southampton, Stansted, Luton and Birmingham airports have yet to be affected. Policyholders are covered against travel delay and cancellations on any planned strike dates under their travel insurance. 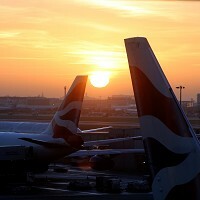 A Heathrow spokesman said: "British Airways flights travelling both to and from the continent are affected. Passengers due to travel today are advised to contact their airlines for the information."